The aim of this paper is to review the latest total fat intake data for South Africa, as well as scientific evidence on the effect of the total amount and quality or type of fat in the diet. The total fat intake of South Africans is within the goal of ≤ 30% of total energy, but the quality or type of fat in the diet requires attention. Fats are key nutrients required for early growth and development, and influence the body’s response to nutrition-related noncommunicable diseases later in life. 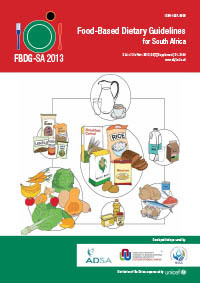 Based on the total fat intake data for South Africa, and the latest evidence on the unique properties of certain fatty acids for health and disease, revision of the previous food-based dietary guideline (FBDG), “Eat fat sparingly”, was needed. “Use fats sparingly: choose vegetable oils, rather than hard fats” is the new FBDG formulated for the fat intake of South Africans. Replacing animal and plant sources of saturated fatty acids with polyunsaturated fatty acids (PUFAs) and monounsaturated fatty acids is recommended. The regular intake of oily fish to increase omega-3 long-chain PUFAs is important. Energy balance remains an important aspect, in addition to the composition of the diet. The FBDG “Use fats sparingly: choose vegetable oils rather than hard fats” is meant to convey a positive message, to ensure that the right types of fats and oils are eaten and used in food preparation for early development and long-term health. An alternative FBDG is: “Eat and use the right type of fats and oils in moderation”.